ST. GEORGE — Whether it is spending time giving speeches to local community groups spurring interest in the program he loves or the countless late nights planning and coordinating even before a plane left the ground, for the past five years David Cordero has been one of the the biggest supporters of the Utah Honor Flight program and local veterans. 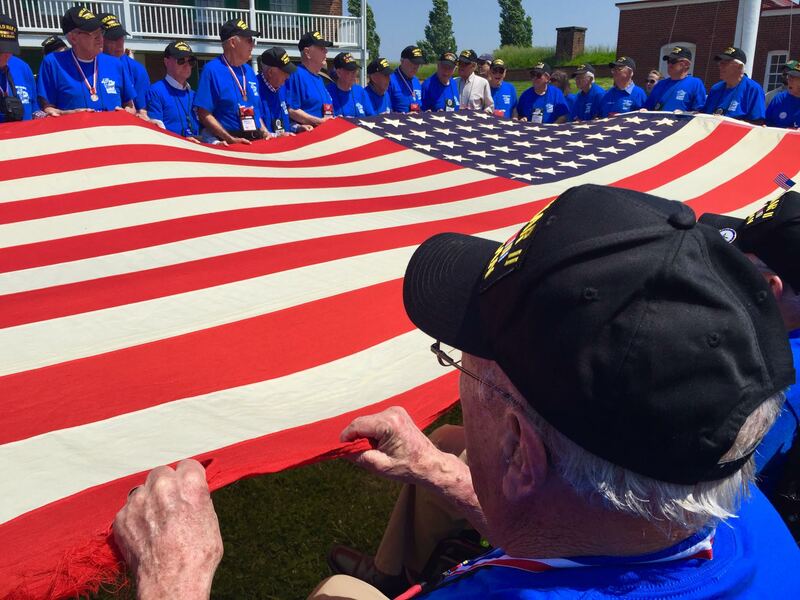 Utah Honor Flight is a nonprofit organization that takes veterans to Washington, D.C., to see their memorials and honor them for serving their country. The trip includes a lengthy stop at the National Mall, where the veterans can participate in a wreath-laying ceremony at the National World War II Memorial, and continues with stops at the Korean War Memorial and the Vietnam Memorial. Veterans and their companions also have the opportunity to visit other historical sites including the Franklin D. Roosevelt Memorial, the Air Force Memorial and Arlington National Cemetery. 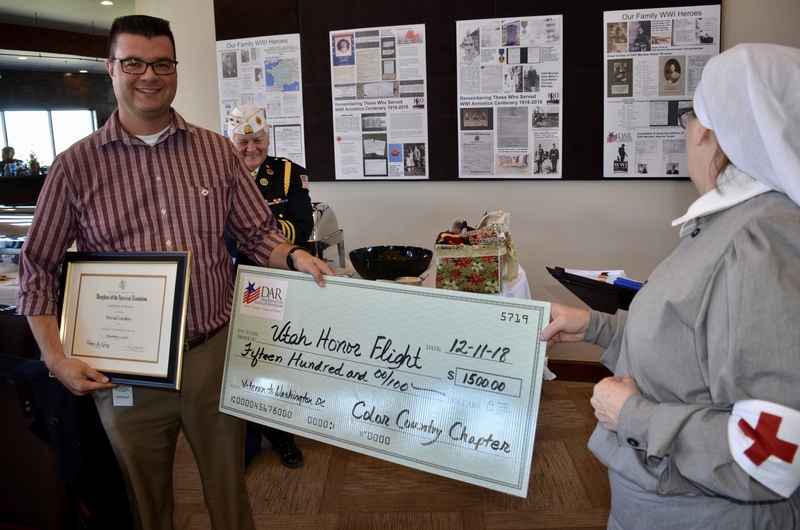 Cordero was recently recognized for his tireless efforts with the program by the Color Country Chapter Daughters of the American Revolution at its annual year-end luncheon with the 2018 Community Service award and a check for $1,500 for the deserving organization. Valerie King, regent for the chapter, said she first got to know Cordero through his work with honor flights and really admired the fact that he was able to volunteer so much of his personal time and love for the program and yet still care for his own family and maintain a thriving career as communications and marketing director for the city of St. George. King learned exactly how much dedication it takes and also how rewarding it feels to participate in the program when she volunteered as a guardian and photographer in November on a flight with her husband Steve. She told St. George News that witnessing the healing aspect is the most touching part of being on an honor flight. Most of the participants on her flight were veterans of the Vietnam War and many seemed to still be struggling from painful memories their time in service and the appalling welcome they received coming home. She said one man didn’t even want to approach the Vietnam Veterans Memorial on their visit. “A lot of them are still suffering,” King said, but added that all of the veterans appeared to love the outpouring of patriotism wherever they went, especially during the parade processionals held in their honor throughout the trip. “Even little kids coming up to them and thanking them for their service. It made them cry – it made me cry watching it,” King said. Cordero has worn several hats during his years of service to the program, including being on the board of directors, traveling once as a guardian, on three trips as a flight reporter and four as the flight director. Utah Honor Flight director Mike Turner said he has been a great asset helping to mold a better program for veterans. “I am very proud and thankful for David’s love and support of our Utah veterans, their history and the Utah Honor Flight,” Turner said. Many of them were in the home stretch of their lives, including a really great friend of mine, Quentin Murdock. Murdock, who chased Rommel around in North Africa, dodged Panzer rounds in Sicily and somehow evaded all the shrapnel and bullets that buzzed through the air at Omaha Beach, lamented that the younger generation didn’t know or care about the sacrifice of those in fought in WWII. Those feelings of disillusion, disappeared during his Utah Honor Flight in June 2014. Teenagers, lined up for 100 yards for the opportunity to shake his hand and others, and thank them for their service. The gratitude and recognition was overwhelming. I teared up. He couldn’t stop crying. Afterward he said that it restored his faith in the American people. Murdock went on to speak to students at Dixie High School several times, inspiring youth in his remaining days. He died late last year. Cordero said he still plans to be associated and support the Utah Honor Flight but admittedly in a much more diminished capacity. He said when you serve on boards you can only really be effective for so long. “A lot of people have expressed interest in helping,” he said, adding that by stepping aside he hopes it will open up more opportunities and make it easier for others to get involved. He said that as his kids have gotten older it has gotten tougher to dedicate the time he feels is necessary to be an effective member of the board and he thinks it is better for the organization to have someone that is available more often. He knows that anyone who gets involved will undoubtedly get more benefit out of volunteering than any effort they put in. “It’s time for someone else to come in with fresh ideas and able to continue to move the ball forward,” Codero said, but added he would still like to volunteer with fundraising and of course, writing for them as often as time allows. King also recommends that everyone get involved with the program, especially if they know of a veteran that could benefit from the heartwarming excursion. “After you go on one of those events with the veterans – you laugh with them, but you cry with them – and it’s the most amazing experience,” King said. Cordero recalled a common sentiment that many veterans mention before they go is feeling forgotten, disillusioned and thinking many Americans did not appreciate their sacrifice, but once they experience the trip, they realize that yes, people actually do care. “We must always appreciate the sacrifices our veterans have made – it’s important to remember them and it’s important for them to feel like they’re appreciated. 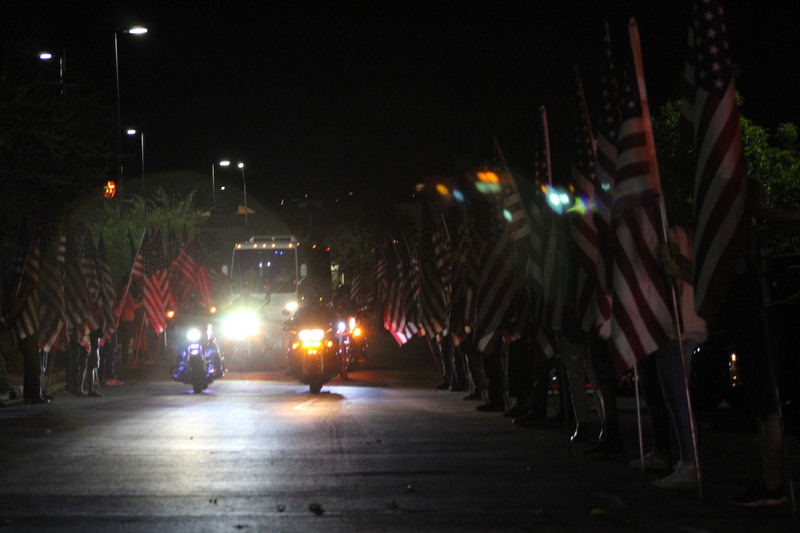 The opportunity to be a part of Utah Honor Flight was one of the most rewarding experiences I’ve had,” Cordero said. To find how you can volunteer, participate as a guardian or join as a veteran on the trip, click here. Expenses for the veterans are funded solely through donations from individuals and companies. Those interested in contributing to Utah Honor Flight can send donations to Utah Honor Flight, P.O. Box 42, Richfield, UT 84701 or call 435-272-0254.